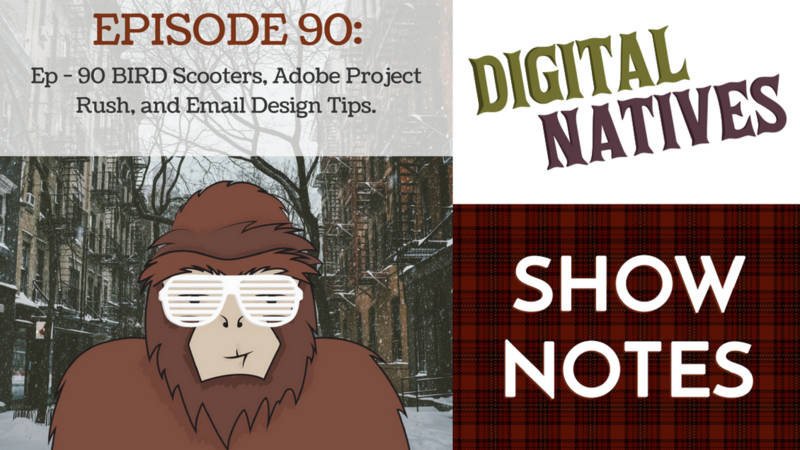 Ep - 90 BIRD Scooters, Adobe Project Rush, and Email Design Tips. This week on Digital Natives, Kyle, Min, Mitch, and Will talk about a new scooter service implemented in Milwaukee, Adobe’s new video editing software, and 6 email design tips to keep in mind. The DN cast talks about updates on the BIRD scooters. BIRD Scooters are electric scooters that you use an app to ride. They are intended for transportation alternatives. Min talks about Adobe’s new release, Project Rush a video editing software. This software is a bit scaled back the Premiere Pro but allows the user to have an easier workflow as well as the ability to work from mobile devices seamlessly. Mitch shares 6 email design tips to make sure you are getting the click-through rate that you need!